Most of you know I am from Georgia. I am very proud of the fact I am a southern girl growing up around good folks and good food! One of my favorite foods from Georgia, besides pecans and Vidalia onions, are Peaches! Sweet, fragrant and delicious! To be honest, I have never really liked flavored teas. Maybe because most (if not all) store bought brands contain “natural flavorings” and not the real fruit. Who wants that?!? I want the real thing babe and that’s what this recipe is all about. I used a harder peach and I did press some of the peach through the strainer. I used a soft peach and pressed the pulp through the strainer. LOTS of sediment! Not recommended. I used a medium-soft peach and did not press the peach through the strainer. Less sediment. Tips for Making the Perfect Peach Tea! If your peaches don’t smell like peaches, your tea probably won’t taste like peaches. When straining the peaches, be sure not to push the flesh through the mesh, just stir the pulp to allow the extra juice to be extracted. For more peach flavor, add more peach but just know that will increase the peach sediment (particles) in the tea. I used fresh peaches but frozen peaches should work. Using a mushy peach is ok but may cause more sediment in your tea. This is not good or bad but just a heads up. It’s really hard to calculate the nutrition because it will depend on the sweetness of your peach and how much peach actually goes into your tea. And of course, it will also depend on the sweetener you choose to use. Be sure to chill the tea before serving. What other flavor combinations can you think of?? Makes 1 quart. Feel free to double or quadruple the recipe. *This tea can be made without any sweetener if you prefer. I used 1/4 tsp. Organic Trader Joe's Stevia and 1/2 tbsp. of raw honey. Add 2 cups of water to a small sauce pan. Add the chopped peaches, cover and cook on medium heat for about 5 minutes (start timer once the peaches start to simmer), or until the peaches have softened. Remove the lid and use a potato masher and mash the peaches in the pan. Add your tea bag, reduce the heat to low and allow to simmer for 5 minutes before turning off the heat. Leave covered and let the tea steep for 5-10 minutes or to your desired strength. 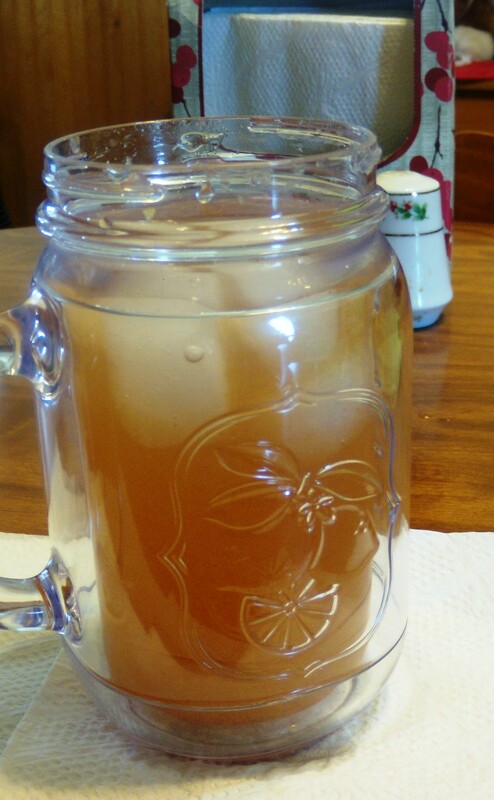 Pour the peach-tea into a quart jar and fill the jar with cold water. Taste and add sweetener if desired. Put a lid on the tea and refrigerate for at least 2 hours before serving. Flavors will intensify the longer it is refrigerated. To serve, shake the tea before removing the lid. ** Taste for sweetness again and adjust if needed. Pour over ice and garnish with a piece of peach. Enjoy! ** Shaking is optional. The sediment settles to the bottom so not shaking will result in a clearer tea. Peach & Mango too! Looks very refreshing – love the picture! This sounds yummy! Unfortunately, I can’t have peaches 🙁 (at least ’til my thyroid heals). I was thinking another option for straining the fruit would be a jelly straining bag. Might work even better than a fine mesh strainer, for getting the juice out without sediment (since that’s their primary purpose 🙂 ). Sorry Cheryl about the peaches.. Maybe soon! 🙂 I don’t mind a little sediment, I actually like it, but yes, that’s a great idea. Even a coffee filter. It would just take too long for me (I’m so impatient with 2 kiddos at my feet)! It’s almost as good as the original Kal just not as concentrated. I do like it but I liked the Original Kal (no fillers) better. I don’t remember posting that stevia comment. Might have been meant for a different recipe comment as I’ve been using TJ’s for a while. But… thanks for the info!